TNT&apos;s masterful, summer saga Dallas tied USA Network&apos;s hit Royal Pains as the top original cable program on Wednesday night. Both series netted a 1.1 among adults 18-49. Dallas was down two-tenths of a point from last week&apos;s demo, and was watched by over four million total viewers. The latest installment of Dallas saw John Ross (Josh Henderson) attempt to blackmail his cousin-in-law, Rebecca (Julie Gonzalo), into setting up a recovering drug addict. He needed to accomplish this in order to gain leverage on the ex-junkie&apos;s lawyer father, who was holding up the deal for John Ross and J.R. (Larry Hagman) to steal Southfork. 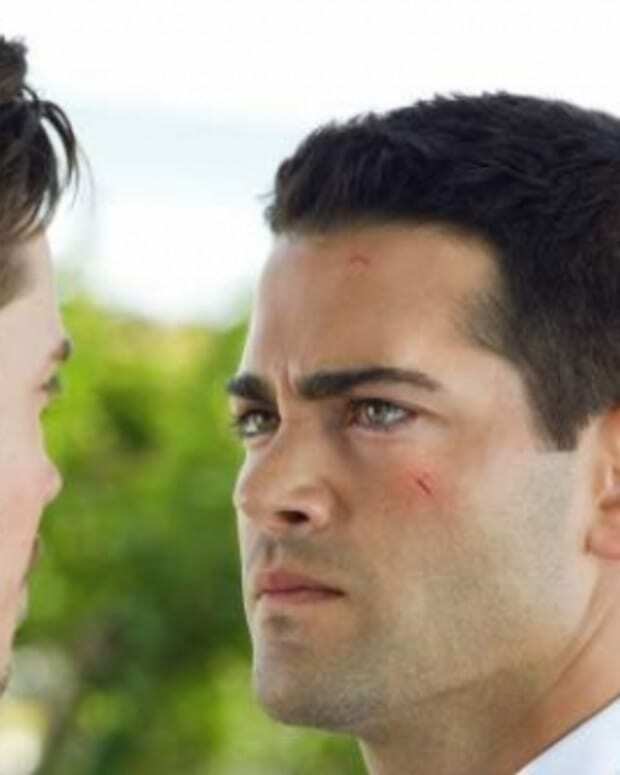 Having found out the email that broke up Rebecca&apos;s new hubby, Christopher (Jesse Metcalfe), and Elena Ramos (Jordana Brewster) came from Rebecca&apos;s computer, John Ross warned the newest Mrs. Ewing he would bust up her happy home if she didn&apos;t comply. While Rebecca proved she had somewhat of a conscience, by chickening out on setting up her mark, Faux Marta (Leonor Varela) was only too happy to do John Ross&apos;s bidding — and then some! Too bad for the oil-baron-in-training, his dastardly daddy showed Faux Marta pics of John Ross in a near clench with Elena, which sent the unstable chica reeling and gave J.R. full control of the situation. Over at Southfork, Bobby (Patrick Duffy) and Ann (Brenda Strong) were busy preparing for one last barbecue. A good bit of the episode was dedicated to a side story about a cow having to be put down in order to save her calf. The calf was then placed with an adoptive mama cow, serving as a metaphor for how Christopher came to be Bobby and Pam&apos;s (Victoria Principal) son. I guess that made Chris&apos; bio mama, Kristin (Mary Crosby), one dead heifer, when she was found floating in the Southfork pool? Cliff Barnes (Ken Kercheval) was back to offer political advice to Sue Ellen (Linda Gray)—and trade barbs with J.R.—and Ray Krebbs (Steve Kanaly) and cousin Lucy Ewing (Charlene Tilton) also made cameos. The soap opera is back! What did you think of this week&apos;s episode of Dallas? Sound off in the comments!